We’ve written before about Langer’s legendary pastrami sandwich, which no less a food authority than Nora Ephron famously deemed the best in the world. The 70-year-old Westlake deli is no one-hit wonder, though; Norm Langer, who inherited the business from his father Al, can often be spotted at the restaurant, doling out corned beef and cheese blintzes with a side of Borscht Belt humor. Sadly, Langer’s closes at 4 p.m. daily—if you’re in a rush, avail yourself of their “curb service” and get an order to go, but be warned that the famous #19 Hot Pastrami Sandwich is best enjoyed at one of Langer’s signature brown booths. 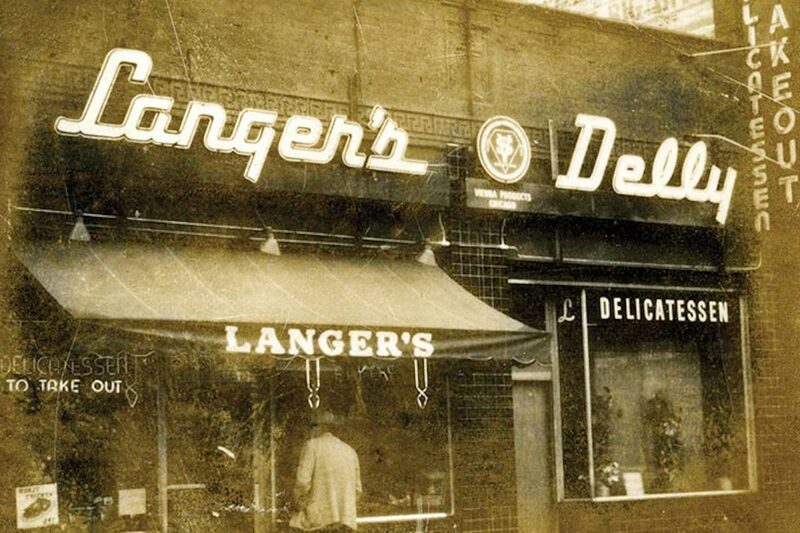 Opened in Westlake in 1947, Langer’s Delicatessen has established itself time and time again as the home of the best pastrami on the West Coast. Even Nora Ephron, the patron saint of the New York deli counter (or whatever the Jewish equivalent is of a patron saint), extolled the virtues of Langer’s in a 2002 New Yorker article, proclaiming the restaurant home to “the finest hot pastrami sandwich in the world.” On Tuesday afternoon, food critic Jonathan Gold sat down with owner Norm Langer and Matt Giamela, owner of Burbank meat supplier RC Provisions, for a L.A. Times Food Bowl-sponsored discussion about what, precisely, has made Langer’s pastrami the best in the business for almost 70 years. “None of you have ever heard of RC Provision, but every time you’ve had a good pastrami sandwich in L.A.—and not just at Langer’s—you’ve been eating his product,” Langer told onlookers at the Food Bowl’s “Pastrami Panel”, gesturing jovially at Giamela. 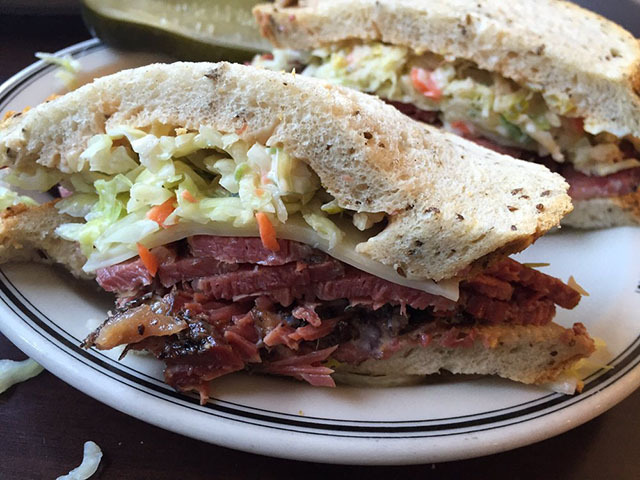 In a long-standing meat dynasty worthy of The Godfather, Matt’s father began supplying pastrami and corned beef to Norm’s father Al Langer over three decades ago. 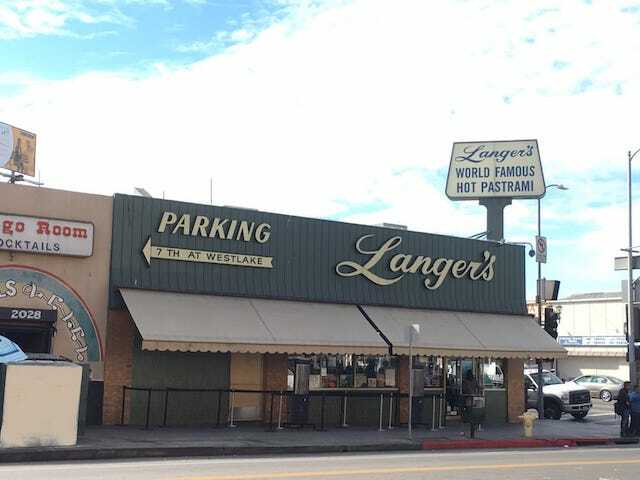 Now, Giamela and Langer have carved out their own distinct partnership, with Giamela insisting that while RC Provision sells its wares to a host of other L.A. delis—including Art’s, Canter’s and Brent’s —the meat he supplies for Langer’s famous pastrami sandwiches is a cut above. “Navel—meat cut from the belly of the steer—is the holy grail of pastrami, and we’ve formulated a special recipe that works for Norm and for his customers,” Giamela said on Tuesday’s panel, refusing to elaborate as to what it is about the meat, specifically, that sets Langer’s apart from all other L.A. pretenders to the pastrami throne. (Apparently, an aura of mystery is the key to good pastrami.) “When fifty navels come in, maybe two of them are up to our standard, and we pay top dollar to get the best cuts,” a Langer’s spokesperson told LAist, explaining that while this picky selection model isn’t exactly cost-effective for Langer’s, it’s worth it for the sake of crafting a perfect pastrami sandwich. Anna Harari at LAist.com has a new article up entitled “The 11 Best Classic And Quintessentially Los Angeles Dishes,” and our world-famous #19 has made the list. What are your favorites here? Some interesting choices, for sure!